I'm working on a collection of dedicated family of the last Russian Emperor Nicholas II. The tragic figure of the Empress Alexandra Feodorovna requires a completely custom ornaments to even a small extent reflect the greatness of her spirit and the power dropped its share of suffering. 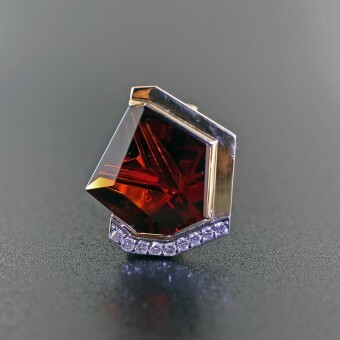 Fantastic beauty stone - pyrope - its very essence brings greatness and solemnity. The tragic figure of the wife of Nicholas II, Empress Alexandra Feodorovna, which addressed a jewel created requires non-standard approach to find the opportunity to reflect on the greatness of her spirit and the power dropped on her share of suffering. Ring is an art object. Was the need to create a unique frame, which would carry the stone in the air. He struggled to hold it beyond metal. Priority is to improve the quality of each element, gorgeous manual work, which forms the harmony and beauty of this jewelry. unique grinding stone (applying complex faces the bottom side ) has revealed in stone, hidden from the uninitiated , blazing inner fire. Original grinding stone is unique in Master Volume Munsteiner (Germany). This art object. It reflects the status of the owner and his life destiny of which is unique. Respectively, and are one of a kind jewelry. Priority is to improve the quality of each element, gorgeous handmade paper, which forms the harmony and beauty of this jewelry. Unique grinding stone (applying complex faces the bottom side ) has revealed stone blazing inner fire. Ring is designed to be worn on the three middle fingers. Despite the large size of the ring, the person does not experience discomfort. The idea of the project originated in November 2011. Actively discussed the future shape and color accent jewelry. The search for the necessary material and grinding stones were conducted during 2012. Ring ending 28.03.2013. First presented at the exhibition at the National Art Museum in Bishkek (Kyrgyzstan) 15.04.2013. The whole idea of this ring search demanded quite unusual color of the stone. To identify the most artistic and physical properties of the stone used manual assembly - mount all metal ring design. The challenge was repeated soldering individual elements that required the use of different temperature regimes. Ring is influenced by the avant-garde architecture today. This reveals a mixture of cultures and spatial forms, which gives me the opportunity to create an abstract composition, maintaining elegance. 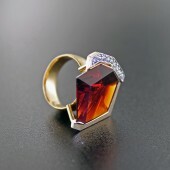 25.0 x 20.5 x 25.0 mm The ring is made of yellow gold 18 K. Pirop original grinding - 17.41cts. 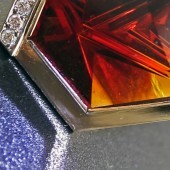 Diamonds of 1.8 mm inserted in a platinum plate, which emphasizes the main game stone (Pyrope) original. I was born in the city of Yekaterinburg, where in 1918 there was the tragic death of the family of the last Russian Emperor Nicholas II. The study of historical materials , diaries family members Emperor remembering his contemporaries - allowed to transfer this information to the jewelry. The key was the use of different stones , capable, in conjunction with the visual design to convey human feelings. 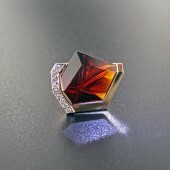 It was therefore necessary to include a new collection of jewelry stones, according to the status owners. Art Project - the difficulty was in the retelling of the human senses in new - jewelry transcriptions. 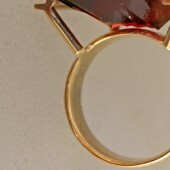 The Empress Ring by Victor a. Syrnev & Tom Munsteiner is a Nominee in Jewelry, Eyewear and Watch Design Category. 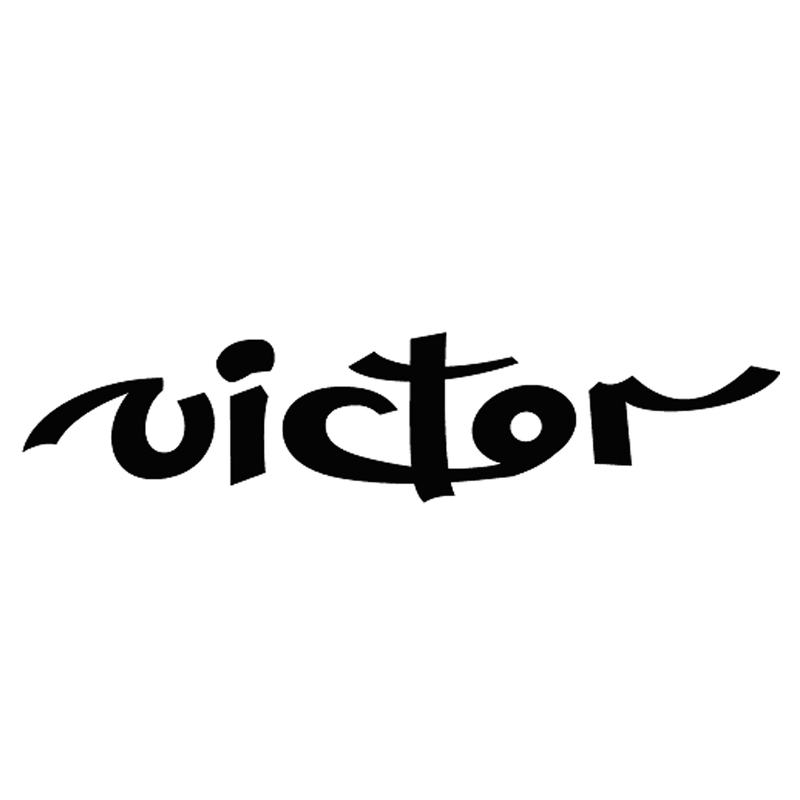 · Click here to register today inorder to be able to view the profile and other works by Victor A. Syrnev & Tom Munsteiner when results are announced. The Empress Ring by Victor a. Syrnev & Tom Munsteiner is Winner in Jewelry, Eyewear and Watch Design Category, 2013 - 2014. · Read the interview with designer Victor A. Syrnev & Tom Munsteiner for design The Empress here. · Press Members: Login or Register to request an exclusive interview with Victor A. Syrnev & Tom Munsteiner. · Click here to register inorder to view the profile and other works by Victor A. Syrnev & Tom Munsteiner. Did you like Victor a. Syrnev & Tom Munsteiner's Jewelry Design? Did you like The Empress Ring? Help us create a global awareness for good jewelry design worldwide. Show your support for Victor a. Syrnev & Tom Munsteiner, the creator of great jewelry design by gifting them a nomination ticket so that we could promote more of their great jewelry designs.